Maybe it’s because I grew up in Missouri and am a country girl at heart. I suppose that is part of the reason I wanted to have chickens in my own backyard. It may seem strange to some, but it is a comforting feeling to me when I drive by fields with animals; horses, cows, sheep, chickens…it really doesn’t matter what kind! Growing up, our family never had a true farm, but we did have horses, dogs, banty chickens and even raised rabbits for a time. Bantys are a small breed of chicken and the chicks are very small. I can remember feeling devastated as a child when I found one drowned in a mud puddle! When we made the decision that it was time to get our own chickens Mike began drawing plans for a super chicken coop. He designed and built it from the ground up. Just another reason why he is my hero! We used old wooden window frames and purchased an old door from a local salvage shop. The coop has a raised foundation so that the “girls” can get underneath the house. They use the area for shade and dust bathing. Chickens take dust baths to get clean and rid themselves of any parasites. The dust clogs the breathing pores of the parasites and kills them off. There are nesting boxes that can be accessed from the outside of the house simply by lifting a lid. It makes collecting eggs very convenient and you don’t have to walk in the house and get your shoes messy to collect the eggs. Mike also built an outside run for the chickens complete with a little ramp for them to go in and out of the house. We used welded wire fencing as I had read that a raccoon can actually unwrap chicken wire. Raccoons love to eat chickens! We also covered the run with netting to prevent eagles and other birds of prey from swooping down and grabbing one. Two of our sweet babies! I immediately began to look at different breeds. I wanted to choose breeds that were people friendly, got along with their fellow chickens and were good layers. I had a difficult time narrowing down my selection and ended up with 2 chicks of 7 different breeds for a total of 14 baby chicks! I don’t think I realized just how many eggs that would be every day! 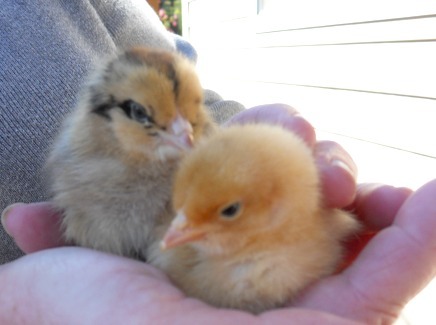 I was so excited the day we brought our chicks home. Our brand new chicken coop….we’ve since painted the window and door frames bright aqua! For the first 8 weeks they lived in a big cardboard box in our den with lights to keep them warm. They are certainly messy little critters! They grew up very fast and were glad to be introduced to their roomy chicken coop. Each of our children and 6 grandchildren chose a chicken and named it; Ethel & Lucy, Lola & Primrose, Spot & Lilly (middle name Pad), Chirpy & Colonel, Buff & Marigold, Bluebell & Fay and finally Peaches & Penny. 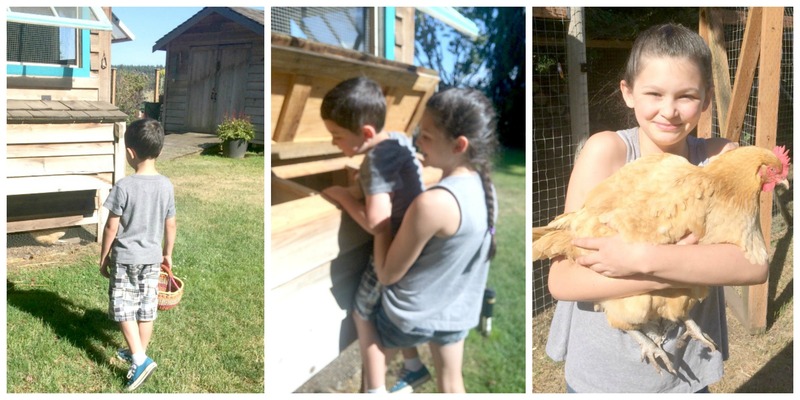 I love that having chickens has exposed our grandchildren to a tiny bit of farm life. They are always anxious to help gather the eggs or the possibility of holding one of the chickens! Connor on his way to the coop……………………. needs just a little help from sister………………..Emma holding Buff, the smile says it all! 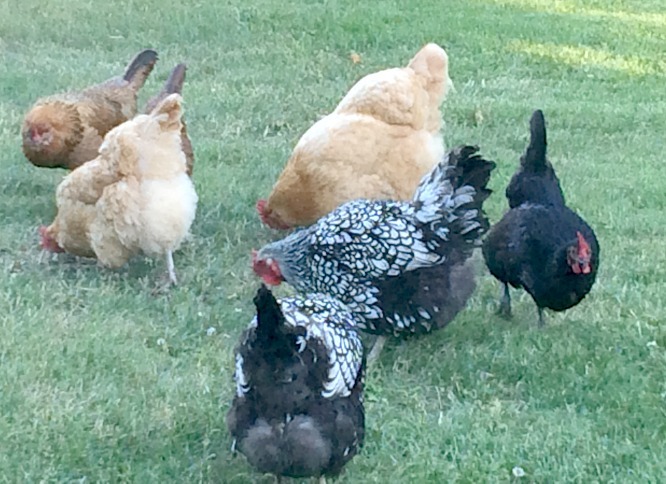 We let the “girls” out into our 1 acre yard as much as possible…free range chickens make the healthiest eggs. They have learned that when I’m digging and working in the yard I uncover many of their favorite worms and bugs. Ethel and Buff love to “help” me with my work! One day as I was weeding with Ethel by my side there was a great commotion in the yard. Ethel ran for the bushes and I could hear the wild clucking of a very upset hen! I ran toward the noise and there on the ground was a bald eagle with its wings spread and Buff in its talons! What a sight it was; a huge eagle attempting to get off the ground and Buff fighting for her life. When the eagle heard me shouting he released Buff and flew to a nearby tree. Buff survived the attack with very minor wounds and all of the chickens spent the rest of the day hiding in the bushes. I would say she was a lucky girl! The blue-green eggs were laid by an Ameraucana. In my opinion that’s a good reason to have your own chickens or purchase from a local farmer if possible. 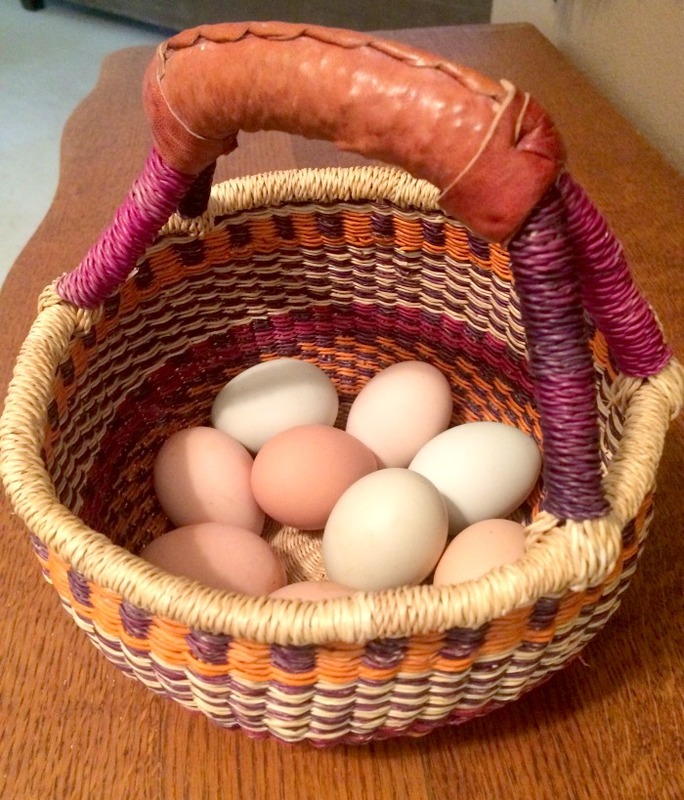 You can tell if your eggs are from true free range, pastured chickens by the color of the yolk. Pastured chickens have a bright yellow-orange yolk while supermarket eggs are a duller yellow. 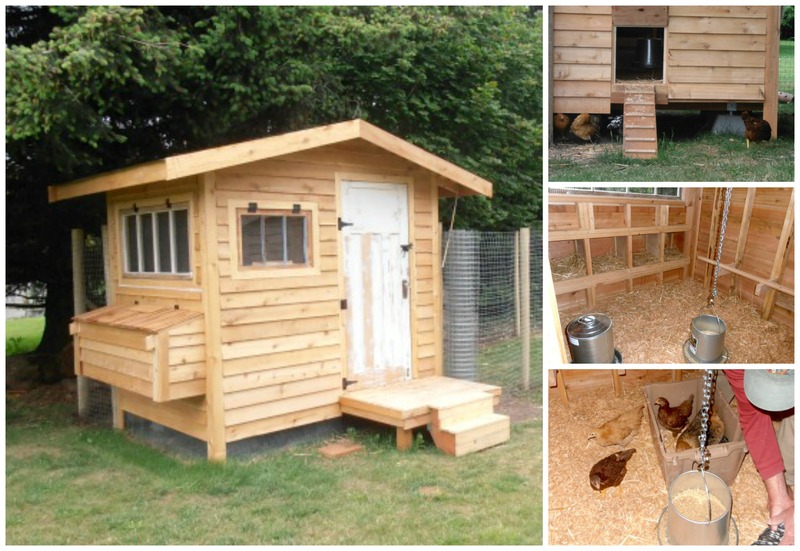 Chickens have relatively simple basic needs; a clean house with good ventilation, a safe place to roam, food and lots of fresh water. One great final thing about chickens is that they always know when its time to put themselves to bed!